The ancient pilgrim path of St. Declan’s Way takes an 96km (56 mile) route from Ardmore, Co. Waterford to the famous Rock of Cashel in Co. Tipperary. It is a modern walking route linking the ancient ecclesiastical centres of Ardmore in County Waterford and Cashel in County Tipperary. It is 56 miles (96 kilometres) long and crosses the Knockmealdown Mountains at Bearna Cloch an Buideal (Bottleneck Pass) near Goatenbridge, Co. Tipperary, at an elevation of 537m. Apart from this stretch, the route passes through the picturesque undulating farmland of West Waterford and South Tipperary. St Declan’s Way Walk utilises the route of a number of ancient and medieval pilgrimage and trading routes such as the Rian Bo Phadraig (Track of St. Patrick’s Cow), Bothar na Naomh (Road of the Saints), Casan na Naomh (Path of the Saints) and St. Declan’s Road. The current route was mapped out and developed by Ardmore Enterprise Cooperative in the mid-1990s and tries to remain faithful to the ancient highways where possible. 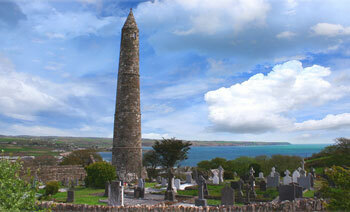 Full details and news on events planned for St. Declan’s Way can be found at http://www.StDeclansWay.ie. You can also catch up with the path on Facebook, Twitter or Instagram.